Never mind. I'll just show you the cover. Didn't Rachel Rossano do a fantastic job on the cover?! She's so great to work with! And big shout out goes to fellow bloggers and friends who either volunteered or were drafted in by me to be a part of the reveal: Michaela, Emily, Evie, Meghan, Susanna, Allison, Rachel, Jamie (my awesome sister)....thank you!!! 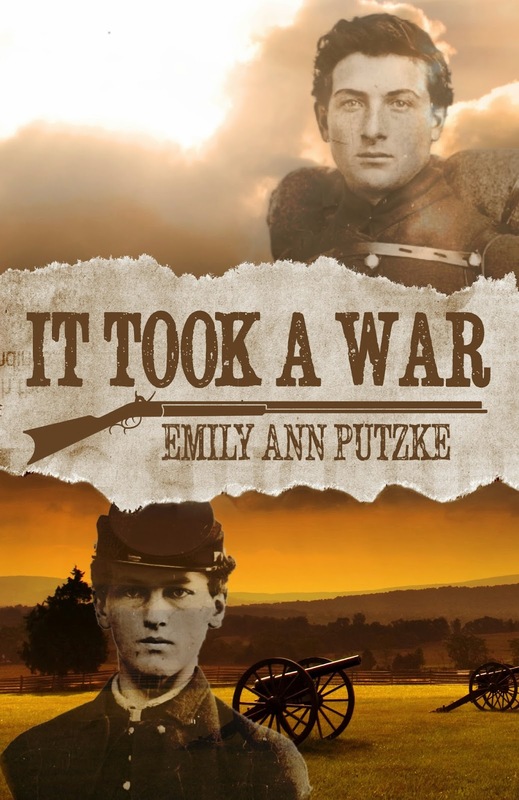 Look for It Took a War in e-book and print this December! Congratulations Emily! The cover looks great! YAY! =D Gorgeous cover, Emily! Thank you, Meghan!! Thanks also for being a part of the cover reveal!! I'M THE OVERENTHUSIASTIC SCREAMING FAN!!!!!!!!!!!!!!!! Thanks for stopping by and commenting, Emily! I'm a newbie to this publishing venture, but you can email me at authoremilyannputzke (AT) gmail (DOT) com and I'll give what advice I can! Oooh, I love this cover! It looks so amazing! It is FABULOUS. So very professional, and it makes me even more intrigued about the book. I am so excited to read it!!! The cover is fantastic! I am getting this as soon as it is out! Congratulations! I saw Evie's post about this book and headed right over. I am so excited for you! I've been looking around your lovely blog as well. New follower! Thank you so much for your sweet words and for following, Rebecca!